With the first football game on home ground coming up this Saturday between Texas and Cal, there’s been quite the frenzy and excitement in the atmosphere this week. Although we’re pumped to see the game in action, there is the question of how the oddly fluctuating weather will influence our game day clothes. In order to save some last minute trouble, we at the Clog came up with a list of style options that would suit any kind of weather. Go simple and put on a pullover hoodie. If you’re a girl, pair it up with a set of leggings. Roll the leggings up if it gets sultry and leave them down if you’re chilly. Rock a quarter-zip jacket over a pair of shorts, and top it off with a fitted hat. You’re ready for the cold, the hot and the wind all in one outfit. Since the game is taking place at night, why not use the timing as inspiration for your clothes? 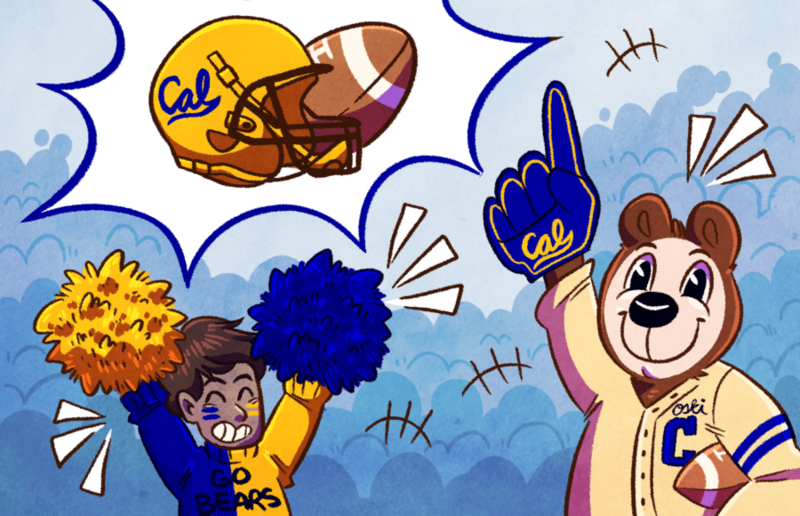 Put on a pair of Cal Bears sweatpants and a tank top, and drape on a sports towel around yourself. You’d be screaming pride while being as cozy as can be. Combine a Cal shirt with a pair of shorts, and wear high knee socks covered in “Cal” to protect you from the cold. If you get hot, you could always roll them down. Keep it simple and wear a cardigan over your clothes (like this one) to keep you warm. Removable clothing is the best choice, since you can adjust it to any type of weather. Always combine your outfit with rally beads, hair clips, face tattoos, ponytail holders or a headband to make you look game day ready no matter what you wear. Contact Sowgandhi Rayapudi at [email protected].